Feeling the chill this winter? why not book in for Hotstone therapeutic massage to warm up, relax and unwind? What is Hot Stone Massage and why is it highly recommended ? Hot Stone Massage is an ancient healing art originating over 2000 years ago in Ancient India & China. 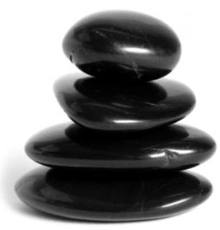 Hot Stone Massage is a deeply soothing, relaxing form of massage water-treated basalt tones are placed on a client’s body to promote relaxation and to help open up the energy pathways (meridians) to help deep relaxation of the muscles quickly. This type of massage allows the therapist to more easily perform deep tissue manipulations without applying too much pressure Massage oils are usually incorporated into this massage treatment. Basalt stones are used as the minerals in basalt help to absorb and retain heat, the longest of any type of stone. The heat contained in the rocks also relaxes muscles, tendons and nerves, and also help to improve Chakra flow if placed on Chakra centers of the body. Hot stone massage is used to encourage faster, deeper muscle relaxation during a therapeutic massage session. It is highly recommended in colder Winter months as tight muscles or Knots quickly ease from the warmth of the hot stones and, thus allowing for quicker deeper relaxation for the client. This ancient practice has recently been revived, and is growing in popularity in healing spas across the world today. Once considered a novelty in the world of massage, it is now one of the corner stones of massage therapy. The warmed stones vary in size, shape and textures;Larger stones are used for larger areas of the body (such as the back) and smaller stones are used on smaller areas.